A fire door is a critical safety device, often neglected and with Fired Door Safety Week Philip Ingram looks at some Fire Door Safety issues and advice. Last week saw an initiative in the UK to focus industry and the public on the importance of Fire Doors through the Fire Door Safety Week so Philip Ingram from Security News Desk and SecurityMiddleEast.com took a look at some of the initiatives and found that their message is equally applicable no matter where you live. Fire Door Safety Week is the brainchild of the British Woodworking Federation, the BWF-CERTIFIRE Fire Door Scheme and the UK’s Fire Door Inspection Scheme (FDIS) and aims to raise awareness of the critical role of fire doors, drawing attention to specific issues such as poor installation and maintenance, and encouraging building owners and users to check the operation and condition of their fire doors and to report those that aren’t satisfactory. "We frequently see fire doors in apartment blocks in a poor state of repair; fire doors that won't close; fire doors that have been wedged open. This is, of course, just one aspect of fire safety in these buildings, but good fire doors are often a sign of good fire safety generally. We are urging all tenants to carry out a simple 5 Step Fire Door Check, and to report any concerns to the Responsible Person, most likely their landlord," she added. 1. Check for certification. There should be a label or plug on top (or occasionally on the side) of the door to show it is a certificated fire door. 2. Check the gaps. Gaps around the top and sides of the door should be consistently less than 4mm when closed. The gap under the door can be slightly larger (up to 8mm is not uncommon), but if does depend on the door - as a rule of thumb, if you can see light under the door, the gap is likely to be too big. It’s good news if the door fits the frame and it’s not damaged. If not, report it. If the gaps are too big smoke and fire could travel through the cracks. 3. Check the seals. Intumescent seals (ones that expand on heat to seal in the event of fire) around the door or frame should be intact with no sign of damage. These seals are usually vital to the fire door's performance, expanding if in contact with heat to ensure fire (and in some cases smoke) can’t move through the cracks. 4. Check the hinges. Door hinges should be firmly fixed (three or more of them), with no missing or broken screws. 5. Check the door closes properly. Open the door about halfway, let go and allow it to close by itself. Does it close firmly onto the latch without sticking on the floor or the frame? A fire door only works when it’s closed. A fire door is completely useless if it’s wedged open or can’t close fully. 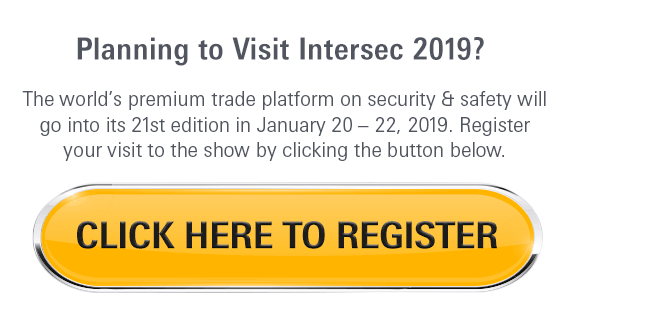 For end users and fire professional alike the best place to be kept abreast of developments in the Middle East is INTERSEC as the leading Fire, Safety and Security show.